Traditionally, a pergola is an outdoor structure that consists of four vertical poles supporting an open lattice of wooden beams. Normally, the structure provides minimal shade or protection from rain. When a pergola doubles as an arbor for creeping plants such as grapevines, you may receive a measure more shade from direct sunlight. If you'd like to incorporate a pergola-style building into your garden but hope to use the pergola as shelter from the rain, you can update the traditional pergola to incorporate transparent roofing materials. If you live in an area where rainfall is heavy and the sunlight is scant, a transparent roof will deliver maximum sunshine and let you remain outdoors through the showers. 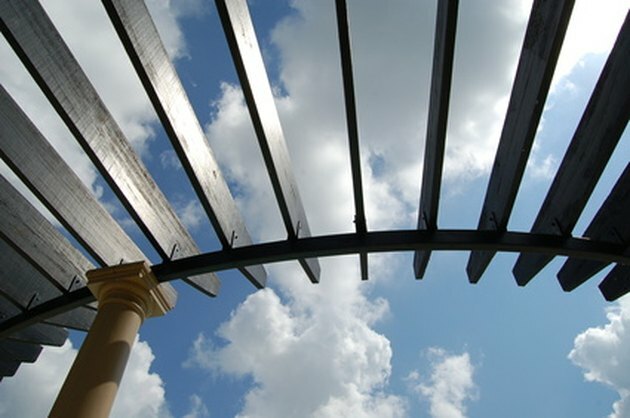 The traditional pergola offers little protection from sun or rain. If you like the materials and design of a traditional pergola, you can use a basic pergola model -- either vinyl or wood -- and simply cover it with a sheet of clear Plexiglas patio roofing. If you live in a warm area, opt for "Heatstop" Plexiglass, specially-designed to keep sunlight from heating up your pergola sitting area and demonstrated 60 percent more effective than double-glazed transparent glass. For a crystal-clear view of the sky, ideal for stargazing, the Plexiglas "Alltop" sheet is completely transparent, resistant to fading or clouding with age. Other Plexiglas variations adapt especially well to hard wear as in locations receiving regular hailstorms or for placing beneath fruit trees and for streak-free rainwater resistance for rainy areas. Naturally, glass panels cannot work in all environments; while glass roofing panels are stronger than regular window panes, they do not have the level of resistance of Plexiglas or other plastics. However, if your pergola's location isn't especially subject to falling branches, fruit, hail or other risks, you might outfit it with glass panels. Instead of using a ready-made pergola design, consult with a sunroom or patio designer to create a sturdy, energy efficient and aesthetically pleasing structure. By consulting with a professional, you can also ensure that your individual pergola meets all relevant building codes. Comfort-Gard's square glass roof panels measure 3 feet on each side and can be built directly into a roof. They are double glazed and feature low-E rated bronze glass, filled with argon gas; all of these design elements add up to high insulation levels. In addition, they are treated to prevent excessive ultraviolet rays, functioning like a large pair of sunglasses to cover anyone sitting below. If you're particularly interested in roof transparency and perfectly happy to sacrifice how closely your structure resembles a pergola, you can erect a completely transparent roof. An unusually-domed roof, such as those sold by SkyVue Patio Covers as "Clarity Domes," may include no more opaque elements than the bolts necessary to hold together individual roofing pieces. If you wish to dress the structure up to better resemble an Italianate pergola, let an attractive vine tendril up one of the support beams.